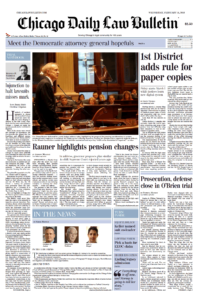 The Chicago Daily Law Bulletin published this piece in print on Wednesday, Feb. 14, 2018. SPRINGFIELD — Nearly three years after the state’s top court ruled sweeping state pension changes unconstitutional, Republican Gov. Bruce Rauner is digging in on the need to try again. The governor in his fourth budget address today said his plan to change retirement systems — a plan that includes shifting downstate teacher pension costs to local schools and getting certain state employees to take on cost-reducing measures in exchange for other benefits — would save billions. The problem is that the latter part of that plan, known as “consideration,” might face the same legal problems as previous plans. The Illinois Constitution contains language that says pension benefits are contractual in nature, and “shall not be diminished or impaired.” Rauner and others, such as Senate President John J. Cullerton, have argued giving employees something else to compensate for pension cuts complies with contract law, and thus, is legal. “The simple truth is this: We have to change the way we manage pension costs and group health expenses. 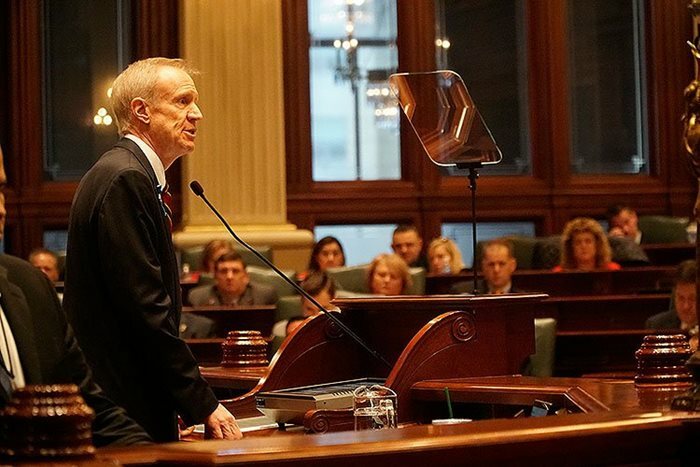 If we don’t, our finances will continue to deteriorate, our economy will remain sluggish and our tax burdens will stay high and keep rising,” Rauner told a joint session of the General Assembly earlier this afternoon. His budget office claimed Wednesday that implementing the “consideration” change for state employees, university employees and downstate teachers would generate $900 million in savings in the next fiscal year, which begins July 1. The idea would not change judges’ retirement plans. So far there are few specifics as to what changes would actually be made, and what would actually be offered as consideration. Because of that, some legislators were cautious about criticizing the idea. “The first step in regards to any pension reform is you have to sit down with any employees that are affected. And the retirees are affected,” said Sen. Andy Manar, a Bunker Hill Democrat who butted heads with Rauner over school-funding reforms. “If you don’t do that, it’s not going to meet any test of the state constitution and that’s just going to set us back here. Others, such as Sen. Heather Steans, a Chicago Democrat, even applauded Rauner’s plan, which estimated $37.9 billion in general revenue along with a $37.6 billion general funds expenditure. Finally, although the governor spoke about the need to improve criminal justice reform during his speech, Rauner’s proposal suggested a hefty cut to the courts. His plan estimates nearly $390 million in spending for the Illinois Supreme Court by the time the current fiscal year ends. Meanwhile, he has proposed spending only $330 million during the next fiscal year, Fiscal Year 2019. A spokesman for the high court declined to comment. Rebecca Anzel contributed to this story.